The apron worn by freemasons derives from the apron worn by craftsmen, which was made from the skin of an animal, most probably a sheep. It was large enough to cover the wearer from chest to ankles, the upper part held in place around the neck. The apron was tied round the waist with a bow in front. The earliest representations of the Freemason's Apron are seen on the engraved portrait of Antony Sayer, (1717), and on the frontispiece illustration of Anderson's first Book of Constitutions (1723). The aprons were worn under the coat to indicate that the apron has a symbolic meaning rather than a practical purpose of protecting clothing. The early fashion of wearing the bib or flap up soon fell into disfavour. The flap was either cut off or worn down as a fall. The engraving by Hogarth shows a Master of a lodge wearing a long apron. The first official reference to the apron is Grand Lodge minutes of 17th March, 1731: "Masters and Wardens of particular Lodges may line their white leather Aprons with white silk, and may hang their Jewels at white Ribbons about their Necks." This regulation was repeated in the 1738 and in subsequent editions of the Constitutions. From 1731 onwards the apron began to assume a more convenient shape, usually kneelength. Leather gave way to softer fabrics, silk, satin, velvet, linen, and chamois-leather. The flap, when retained, was either cut to a triangular form or in a semi-circular line. The lower part of the apron was sometimes squared off, but generally the corners were trimmed to give a semi-circular line. 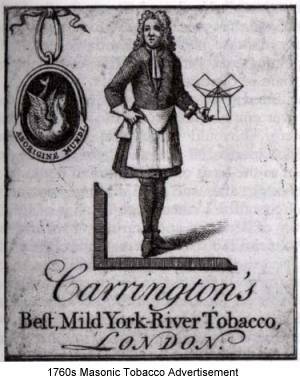 As there was no official ruling on the subject, light blue edged aprons became fairly common among freemasons from about 1745 onwards. By 1784 the apron was greatly reduced in size. For a long time there had been considerable laxity and no definition laid down as to uniformity. So long as the material was white the face might be decorated with any number of Masonic symbols or other symbols without infringing the law. The size had grown smaller and smaller. It was within the power of each freemason to invent for himself almost any apron he pleased. Uniformity and regularity in the material, design, form and decorations of the apron were not regulated until The Constitutions of 1815. A plain white lamb skin 14 to 16 inches wide, 12 to 14 inches deep, square at bottom, and without ornament; white strings. A plain white lamb skin, similar to the, entered apprentice, with the addition only of two sky blue rosettes at the bottom. The same, with sky-blue lining and edging, 1 1/2 inch deep, and an additional rosette on the fall or flap. No other colour or ornament shall be allowed except to officers and past officers of the lodges, who, may have the emblems of their offices in silver or white in the centre of the apron. When considering the apron it is prudent to make a clear differentiation between the terms of Symbol, Emblem and Badge. Symbol is an idea, sign, device or object which has within itself something else an idea, or fact, even a proposition, which it guards from facile scrutiny, but which it may yield, if it be studied. Some symbols are simple, others very complex. In Freemasonry, certain symbols denote somewhat vaguely certain "virtues" or "facts', while others are capable of a wide interpretation. Emblem is also a symbolic device, but its meaning does not have to be discovered; its meaning is obvious, known and accepted by common agreement: e.g., a crown means royalty, white means purity. Badge is a mark or sign by which a person or object is distinguished ; it is a device used to make known membership of any corporate body; it really serves its owner to establish his identity, as indeed his own name does. Masonry uses all three, symbol, emblem and badge, and in some cases symbol and emblem seem to be the same. The exhortation to the newly initiated brother must be recalled. It warns him "never to put on . . ." The apron is, therefore, in its final value not only an official badge of membership of the antient and honourable Society ", but a monition that a brother must ever understand and conform to the ethic of the Craft, so that in the Lodge, at least, a righteous, enjoyable and fruitful peace shall prevail. The symbolical explanations which are virtually standardized in the modern rituals are clear, simple and wholly satisfying. A poem by William Blake is an example of the persistence in popular culture of the image of Jesus as the Lamb of God. It was taken up by the Suffragettes in 1917 as a song to become the Women Voters' Hymn because people enjoyed singing it and having the vote ought to diffuse a good deal of joy. 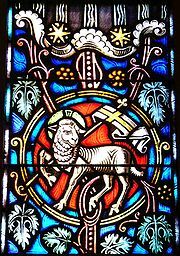 In the Temple at Jerusalem, a lamb was sacrificed during the Passover (the "Paschal Lamb", Hebrew: Korban Pesach), the blood was sprinkled on the altar, and the whole of the lamb was eaten. In the original Passover in Egypt, the blood was smeared on the door posts and lintel of each household (Exodus 12:1-28). Earlier references to the sacrifice of a lamb occur in the story of Abraham and his son Isaac, as well as the story of Cain and Abel. Many people can recall that Adam and Eve made aprons for themselves from fig leaves in the Garden and Eden. Fewer people are aware that Adam and Eve were subsequently clothed by a benevolent Deity in garments made from the skins of animals.